Tartan Fairytales : T.M.I Tag - Laura's turn! Laura here, so I have seen that Gemma has tagged me to do the T.M.I Tag. So here I am - ready to go! - Jeans, a crop jumper and a floaty scarf! - I'm the same height as Gemma - 5ft1! - I have no idea. I don't weigh myself a lot! - Right now I have 2. One on each wrist - it's a personal thing between my mum and I. She is also planning on getting the same phrase tattooed too! - Very thankful for Gemma's answer as I didn't know what that meant either! But my fave couple would for sure need to be Chuck Bass and Blair Waldorf! I'm still obsessing over Gossip Girl! I miss it so much. - Real Houswives of Beverly Hills, Vanderpump Rules, The Hills, Gossip Girl (Duh!) and Breaking Bad. But right now I am loving Ja'mie: Private School Girl - it is hilarious! Quiche! - Ah I love loads! The 1975, The Maine, The Summer Set, Brand New and currently loving Modern Baseball! Their new album has just came out and it's brill! Check it out here! - Right now it's Your Graduation by Modern Baseball! - I am also 20! 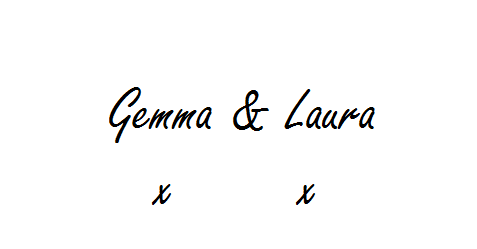 There's only a week between Gemma & I! - Someone who can make me laugh! And someone who is honest! - Oh yeah, Gemma is obsessed with Adam Sandler!! I think my faves gotta be Zac Efron or Adam Brody! - Black. That counts right?! - Depends on my mood - normally loud! - No! I'm such a scaredy cat - I hate confrontation! - When guys are rude! - I love beauty and fashion and writing - so blogging is a perfect combo of them! Bananas. I know that sounds stupid. But seriously it makes me want to cry even being near one! Give me spiders any day! - Oh man. Just some family stuff going on, and I let it all get on top of me! - About 20 minutes ago to my dad as he went to bed! - Read Gemma's answer haha! - It was Beautiful Disaster by Jamie McGuire. Such a good book. And I'm currently reading The Faults in our Stars. I've tried to put it off for as long as possible as I've heard how sad it is. - I'm currently reading The Faults in our Stars. I've tried to put it off for as long as possible as I've heard how sad it is. Darn you John Green and your amazing writing skills! Fun fact - I've actually met John Green & Hank and they were so lovely and he very kindly signed a copy of my favourite book for me - Looking For Alaska! - Ja'mie: Private School Girl, whilst writing this. The guy who plays Mitchell is super cute! - My dad as he went to bed. - I'm not a big fan of food, but I have a serious obsession with pizza recently. It's really not healthy the amount of it I've eaten in the last few weeks! - Yep. But celebrity wise it's gotta be Zac Efron just now, because I've just seen That Awkward Moment and he is beautiful! - At the weekend. Over something silly, but insulted me personally. - I can play a few chords on guitar, and I can play a mean rendition of Merrily We Roll Along on keyboard! - Probably a tie between a gorgeous necklace my best friend got me for my 18th and my Thomas Sabo bracelet from Gems. - HA! That's funny... I don't do sports. - I agree with Gemma. Cringe. - Well I hung out at the hospital on Wednesday until the early hours of Thursday with family, waiting for my nana to be seen to? - Everyone! This was so much fun! Thanks for tagging me GS!